You can read the past entry Here. You can watch this and other Anime officially and for free in Daisuki! The Chapter starts with Wakamizu praising Wakamizu for the good job that Wakamizu did since the Stride Gate will open soon and the Peace Maker is ready, of course everything will go fine because Wakamizu has the Management of the device, so Wakamizu gives props to Wakamizu for that! Enishi and Hiroki are in there, although they are ignoring him right now. Back at Company HQ Shouma is talking with Wakamizu and it seems that Shouma wants to put his hands on Wakamizu´s machine in order to make some trouble since he wouldn´t be amused if Company wins so easily, so obviously Wakamizu won´t let any other than Wakamizu to touch his precious device, so both will have a fight! Meanwhile Shion has reunited with Tokoha and Chrono in a strange location, it seems the three of them have been reunited in here, such person is Am…Although Shion says that he has been summoned by “Ace”, Am´s Persona. Continuing with the fight, who already is andvanced, Wakamizu reveals to Shouma that he is not truly invested or interested in Ryuzu´s “Perfect Future”, still, he won´t allow any interference between him and his device! The turns goes swiftly, Wakamizu says that one of his greatest Joy is to commit for an interesting and amazing experiment, making the hypothesis, works on them, give them shape, research, and in the end see the perfect results of his experiments! That is his Joy! Shouma starts with his turn and do his technique of Soul Charge and Soul Blast in order to fill his field and to give more power to his units. At the same time he features the new Genesis hability, “Revelation” were he draws a card of his deck and he can put it were he wishes, his deck, soul or whatever. Nasty! Back at where Try3 is. Am has a favor to ask to them… To Rescue Luna, Tokoha is worried sick for Luna´s wellbeing so she starts doing lots of questions, Am basically tells them that Luna wants to sacrifice herself in order to open the Stride Gate and well, what it was said in the past chapter, So Am starts begging for their help! Chrono makes the question…If she knows how much damage she has done to them? Destroying Shion´s family and business, destroying the United Sanctuary Branch, and helping with the destruction of the Dragon Empire one… She has damaged a lot of people. Am keeps begging for their help, that she will endure any punishment. Shion yells her to stop. Back at the fight, Wakamizu tells Shouma that his wicked plans of trolling everything won´t succeed since he has a very well made plan to avoid such thing. Wakamizu starts his turn and do his moves of paralyze units so they won´t block nor attack! Nasty! Wakamizu manages to turn the table! Nasty moves! Now is Shouma´s turn. Wakamizu is delighted seeing what he has done, still Shouma manages to stand or replace some units via card Skills, that is good thinking! Wakamizu still believes he has the upper hand though, also he reveals that Vanguard is one of his joys too… To make a deck plan a strategy, make test and then, seeing a big parade of victories in front of him, it´s basically like making a experiment. Shouma´s moves are amazing, still he is not able to defeat Wakamizu! Who BTW made his deck in order to defeat Shouma. Now Shouma has declared that he will win in the next turn! Back with Chrono, Tokoha and Am. Am says that of course they wouldn´t want to help her, she was a fool for believing she had a chance, still she gives her thanks and decides to leave. Then Tokoha stops her and tells her that while she is mad and she planned to give her a piece of her mind, now… she won´t do that because: first, she had the chance to avoid all of this from happening and did nothing and; second: she is her friend and she has her support… Both of them will rescue Luna. Am starts crying and Tokoha hugs her. Back at the fight Wakamizu keeps doing his shenanigans with Shouma units, although Shouma is not impressed and basically says that Wakamizu must learn about “fluctuations” those little and unsuspected changes in things, so little that nobody notices it. The sun entering in the shadow of a tree for example,they exist in the smalles and the biggest things … Now, those fluctuations exist in Vanguard too. Wakamizu attacks and Shouma blocks all of the attacks! No matter how much power Wakamizu units had! Wakamizu is flabbergasted by such thing! It was supposed that this match had to be over already! With his victory! Shouma keeps talking about the Fluctuations. Shouma likes those fluctuations, he enjoys them, to see something that should be perfect and stain it a little, not too much, just some portion in order to see what it can affect it. That´s why he wants to put his own spin in Wakamizu´s experiment and see how the thing unfolds, like Wakamizu said, this is…His Joy. Wakamizu tries to fix the thing; but is too late. Shouma is disappointed at Wakamizu and even has called him “Stupid”. Shouma brings his G4 Card! The Next version of Fenrir! Shouma starts abusing of the Revelation skill and has basically shaped the order of his deck cards as he wished! Nasty! Wakamizu tries to block like crazy! Still, he loses against Shouma. Now the Judgement has come. Shouma retires Wakamizu from the place, and Wakamizu is retired by the robots while he is yelling that no matter, the thing will go perfectly even without his input! Wakamizu is perfect!! Shouma sees that the last unit has been brought, the Monkey. An Amazing Episode! Man that ending just left us with more questions than answers! The fight was awesome and how Shion reacted to Am was truly good too! Since he couldn´t forgive so easily the person who destroyed his life so easily. Now talking more clear, the fight was good, and looking Wakamizu acting desperate now it was truly good! Still it is not clear if he is not able to come back or if he is still part of Company. Although I will say yes, he still is. Now Shouma…Man that guy just wants to see the world burn! He just wants to troll any plan and everyone who surrounds him just for his own selfish satisfaction, his joy, now he has written the name of Kouji Ibuki, which it would be a troll move to Ryuzu and the other members of Company, now that they have the victory at hand. You Shouma are truly a troll and I Hate you! So please, because of that never change…Because you are one good awesome character! Heck I wouldn´t be surprised that you will ended up being the final bad guy in the end! (Like Raul in Legion Mate). 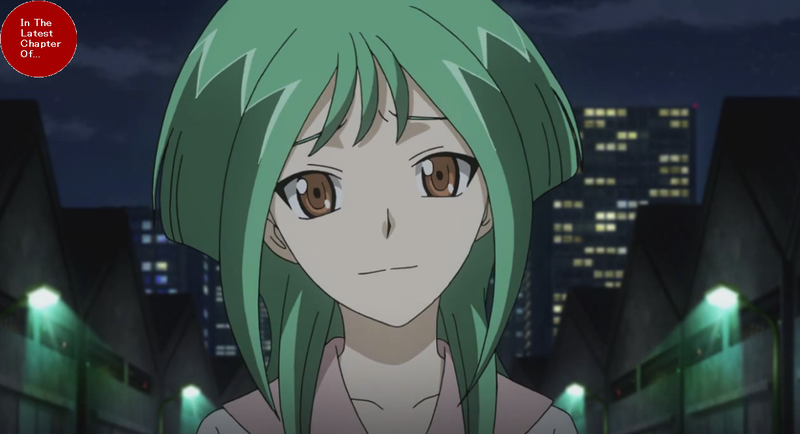 Finally I liked the scene with Am, how Shion reacted, since he don´t see Am, he see Ace, the A-Hole who destroyed his life and his family, now with Tokoha it was truly heartwarming how she got her resolve of not to spread hate to her; but to forgive her and show her that no matter what she has done to them, she is still her friend. Now I can´t wait to see how the things develops on the future chapters! Anyway, my two cents so see ya next time!